I found this lovely white crochet bottom top for only £1 and I can't wait to wear it! I also found this cute little paisley scarf for £1. It's the perfect size to tie in my hair or wear around my neck and I really want to get some more paisley into my wardrobe. Lastly, I found this un-opened Karl Lagerfeld bottle of coke for 50p. They're about £1.50 new anyways and I've started making a collection of the fashion designer coke bottles on my window sill including the Jean Paul Gaultier ones. I want to collect all of them! I picked up this lovely Topshop skater dress in my size for only £2 and Joe picked up this aztec print camera strap for his collection for £1. He recently graduated after studying Photography at uni so he has a lovely little collection of cameras and camera accessories, he always manages to find himself some nice bits at the carboot! Joe found this lovely ship painting framed in a burgundy and gold frame for £3, got the three packs of film for 50p and the ten pack of Polaroid film for £1. Even though the films are out of date, he likes to experiment with them and you can sometimes get really unusual colours from out of date film! I found this un-used Balmi in the Blackcurrant flavour for only £1. I was so happy when I found this as they RRP for around £5 and I've been wanting to try one out for ages! Joe never really seems to find that much clothing as the carboot, so he was pleased to find a Vans checkered shirt and a Stussy t-shirt for only £2 each. They were both in brilliant condition, and the shirt was so soft - I will definitely be borrowing it in the colder months! Lastly, and most probably leastly, I found this little pig mug! Me and Joe are both obsessed with pigs, and plan to have only vintage floral and piggy mugs in our house! He's a bit naff, but for 20p I couldn't resist him! Which is your favourite find from my carboot haul? Have you been to any good carboots recently? Great finds! I love the Topshop dress! 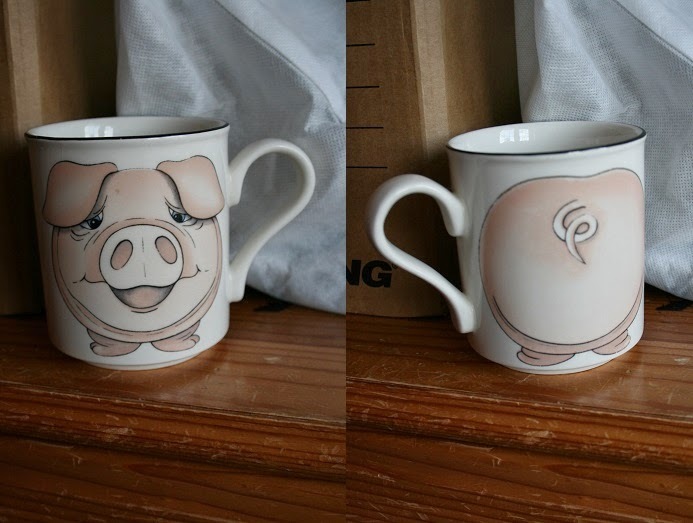 Aw omg, how cute is that pig mug!! I want one! I absolutely love your blog, its so unique! Those cupcakes look yummy! Did you only get the one? haha. Also the camera strap looks great! I love having a wonder around carboot sales! The dress you picked up in lovely.